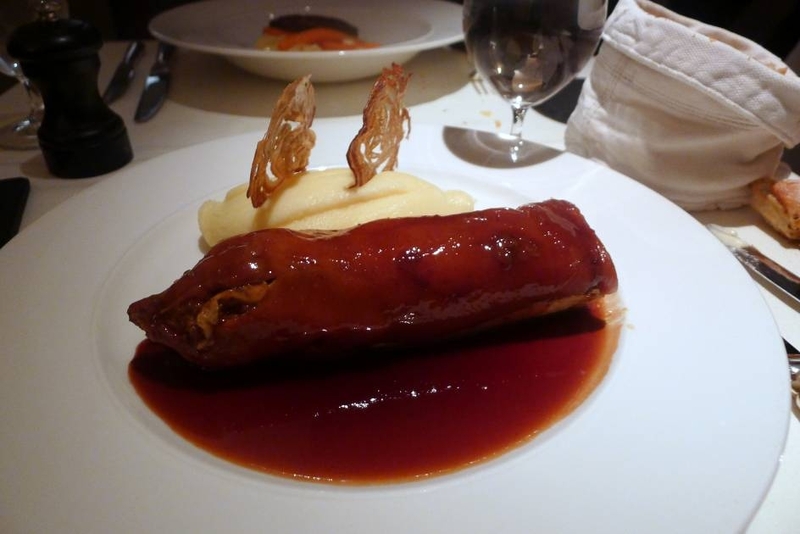 Pierre Koffmann made his permanent return to the London dining scene with his restaurant Koffmann’s at The Berkeley. When Pierre Koffmann appeared during London Restaurant Week 2009 with his pop-up restaurant at Selfridges, Restaurant on the Roof, he became the toast of the town. The ex-three star Michelin chef went into retirement after closing Le Tante Claire in 2004, so his pop-up stint was always going to create some excitement. Restaurant on the Roof was pricey, but it was well worth a visit. The food was very good, and the ambiance was great. And of course there was the opportunity to try his famous pig’s trotter dish. Koffmann’s at The Berkeley received a fair bit of press during the last couple of weeks as a consequence of Kate Middleton dining there with The Duchess of Cornwall. 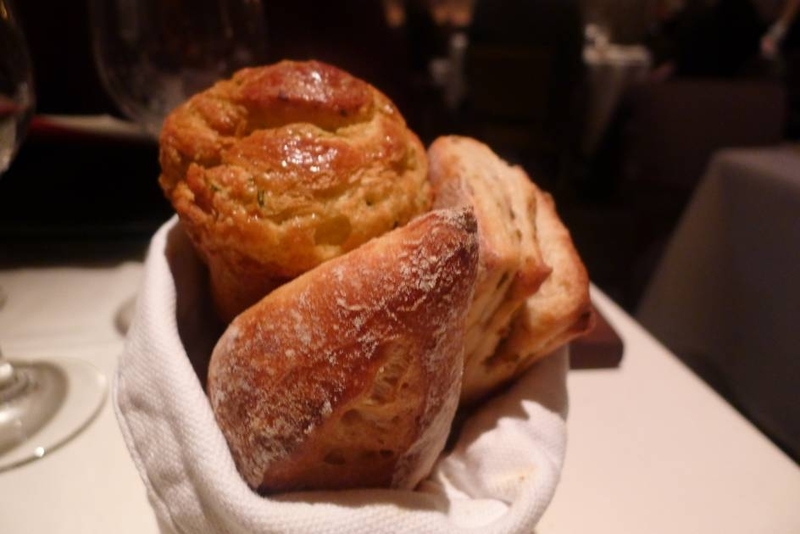 The restaurant opened last summer, and occupies the space that was previously Gordon Ramsay’s Boxwood Café. The dining room is elegantly furnished and sits on the lower ground floor. As nice as it was, I am not a big fan of this basement eating with no windows. The placement of the toilets is also awkward – you have to up the stairs, go past the reception, and then go down another set of stairs to get to them. Why there is no connecting door between the dining room and the bathrooms is a mystery to me. 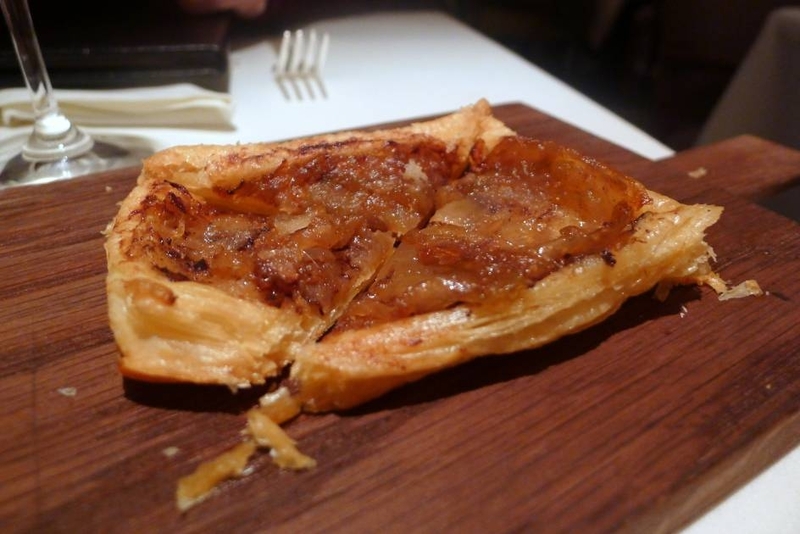 A pre-starter of caramelised onions with anchovies and olives on puff pastry was a little salty. The puff pastry wasn’t particularly light. 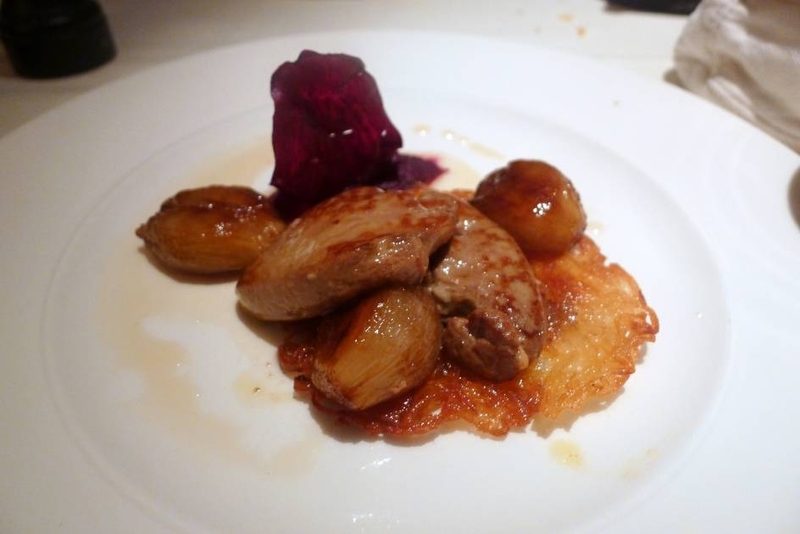 We started with one of the special entrees of the day, a pan-fried foie gras with sauterne (£13). I did not like this dish The foie gras tasted bland and had a slightly bitter aftertaste. It was accompanied by a beetroot puree, which could have been smoother, and some caramelised onions which were a little underdone. The rosti potato cake didn’t work with the foie gras either, and the dish as a whole needed more sauce as it was a little dry. I got the feeling that this starter had made it onto the specials menu as the restaurant was trying to get rid of old ingredients from the fridge. 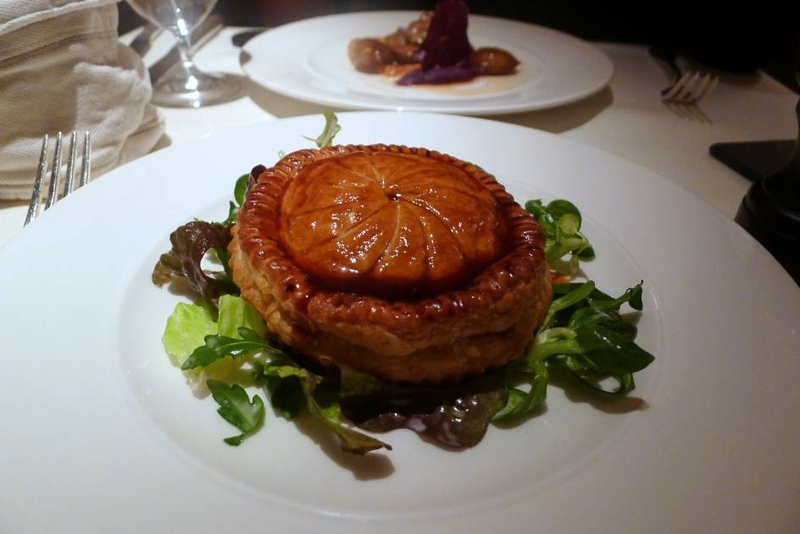 Better was the game in puff pastry with thyme sauce (£12), a hearty mousse-like mixture of game encased in a decent, but slightly heavy puff pastry. Tasty as it was, we spotted some unevenness in how the filling had been mixed. Breads included olive, pesto with pine nuts, white and brown. The crusts were all excellent, although the centres of the dough were a little stodgy as if there was too much moisture in the bread. The pesto with pine nuts was like a brioche in texture. But if it was meant to be a brioche, then it wasn’t quite buttery enough. I couldn’t past up the chance to sample Koffmann’s signature dish of pig’s trotter stuffed with sweatbreads and morels (£28) again. The trotter was soft and succulent, and the stuffing was rich with flavour. It was accompanied by a side of creamy, decadent mash, and finished with a Madeira sauce that had been reduced to a thick, sweet consistency. The sauce rounded of this wonderful dish. 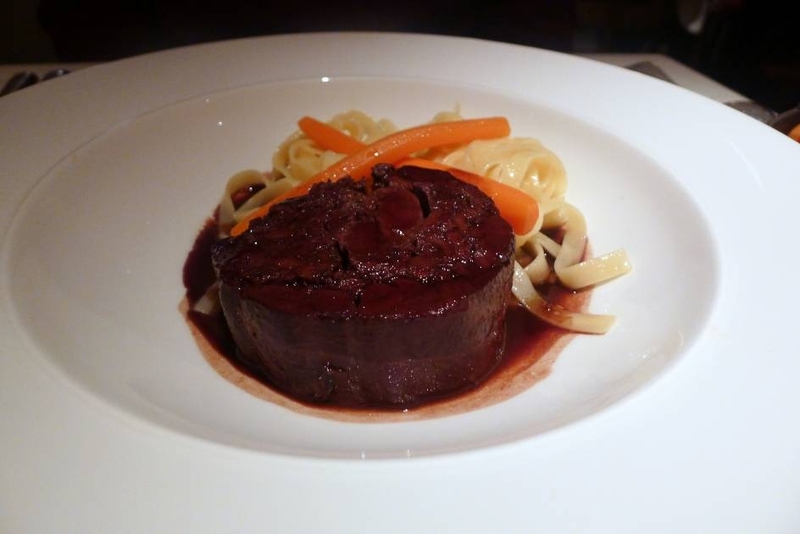 Our next main of braised hare with foie gras (£25) was a disaster. The hare was so dry it grated harshly on my tongue, making it painful to eat. To be fair, there was some nicely cooked homemade pasta with a red wine sauce. All of the main courses came with vegetables and chips on the side. 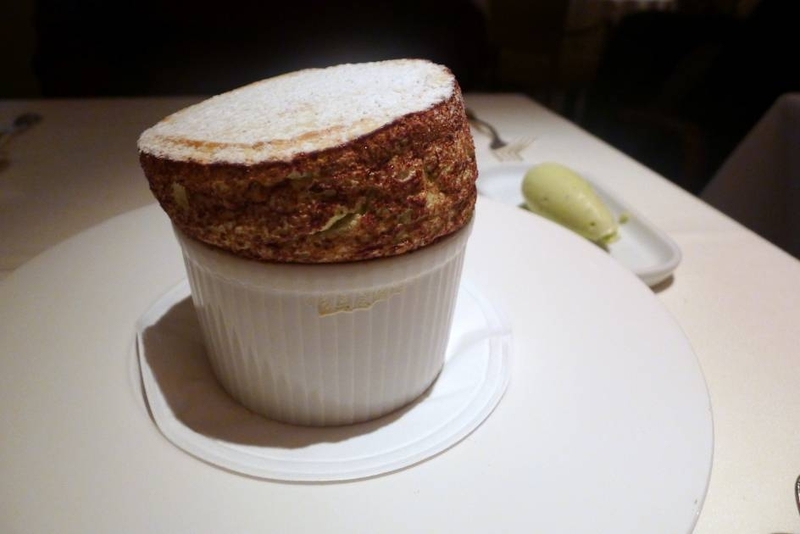 We finished with Koffman’s signature pistachio soufflé (£14) served with a wonderful pistachio ice cream. The soufflé was slightly lopsided and there was a pinch too much salt in the mixture, but it had a nice pistachio flavour. (For the record, Raymond Blanc likes to use a squeeze of lemon juice rather than salt to help the egg whites rise). The pig’s trotter lived up to all expectations, and I only wished that all the dishes could have been cooked to this same wonderful standard. The rest of the meal was quite patchy, and we were not the only guests to suffer cooking errors. The table next to us was served an almost raw spiced breast of duck which had to be sent back to the kitchen. I wasn’t that enthralled with the service either. The lady that brought us our food was quite congenial, but our primary waiter was one of those snooty unpleasant types. Based on my experience at Restaurant on the Roof and the reviews that Koffmann’s received when it first opened, I had had thought that my meal would be better. Koffmann wasn’t in the kitchen as he doesn’t usually cook on weekends, and it obviously had an impact on the quality of the food that we ate. But this shouldn’t be an excuse for cooking that is below par. It’s not as if we had the choice of paying less for our meal just because he wasn’t in the kitchen. The pig’s trotter dish was great, but the rest of the meal was hit and miss. If you go to Koffmann’s you’d be taking your chances. Price range: £41 – £69 for three courses. Excludes drinks and service. How do you do it? You’re always a few weeks ahead of me when it comes to getting to the good places. Literally, last night, I was arranging a trip here. As always, useful info to know in advance. Oh what a shame, seems that his absence from the kitchen has a big impact on the quality, though I’d still expect better with things like puff pastry, given they must be working to same recipe! We had a far better meal there but it had JUST opened so perhaps not representative. Hi Kavey, I agree Koffman not being there had an impact on the kitchen, even though it shouldn’t have. Hi Tori, Yes I think what my experience demonstrated was that the kitchen is inconsistent.